This story of a home exchange to Almere in the Netherlands was shared with us by Sandra. 2. How did you find your exchange? 3. What was it that attracted you to this exchange opportunity? I was born in the Netherlands and lived there until I was 12 years old. Although I visited the country regularly during my teens and twenties, I stopped doing so when my children were born. My family lived in the United Kingdom and I lived in Ireland, so lots of my travel was between those places. But I kept meaning to go back and show the country to my sons. I added the Netherlands as one of my preferred destinations and received an offer at a time that suited us for a house that looked attractive and that was slap bang in the middle of the country, meaning it would be easy to get to different places. This was our 9th home exchange! Usually, we meet our hosts or at the very least have a Skype call, but this time we did not. We did have lots of email contact, however. When we arrived there were many maps and guidebooks available for us. 5. What did you see or do during your exchange? We did so much! We are an active family so we did lots of cycling, but also walking, geocaching, swimming, paddle boarding and waterskiing. We visited national parks, villages, towns and cities. We appreciated old buildings such as castles and windmills as well as impressive modern architecture and feat of engineering. We shopped, went to museums and galleries and tried out an escape room. And we still found time to relax in the house and garden of our hosts! 6. What is the favorite memory from your exchange? It was probably showing my sons where I used to live as a kid. 7. 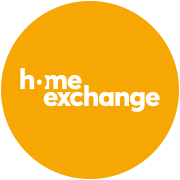 How would you describe home exchange to your family and friends? We love home exchanging. It is a very affordable way to travel as a family, especially because we have always swapped both our home and our car. Every family we have hosted has been lovely and it has been a positive experience all-round. We have persuaded many of our friends to try it out too and they agree that it is an excellent way of holidaying. We are already looking forward to next exchange.